Some people are truly lucky when it comes to nodding off at night. For them, it is as easy as lying down, shutting their eyes, and waking up the next morning feeling refreshed and ready to get on with the day. Moreover, sleep deprivation is associated with an increased risk of Type 2 diabetes, depression, obesity, and disruption of cognitive function, among other major problems. So, clearly, sleep deprivation is no joke. You can try rectifying your sleep troubles by going to bed early, exercising, taking warm showers, and so on. And while all these efforts are beneficial and worthwhile, one thing which you’ll most likely overlook is your sleep environment ― your bedroom. “Our bedroom sets the tone for our sleep experience,” says Sharon Martin, LCSW. “For many, the bedroom is their sanctuary within their home. It’s a space for quiet, safety, and peacefulness. It’s a quiet retreat from life’s problems. Our physical environment has a significant impact on our mood and well being,” she adds. Investing some time and effort in setting up an ideal sleep environment will most certainly pay off. Here are seven easy hacks to creating the perfect sleep-inducing environment. The first step to creating a sleep-friendly bedroom is optimizing your bed for sleep. 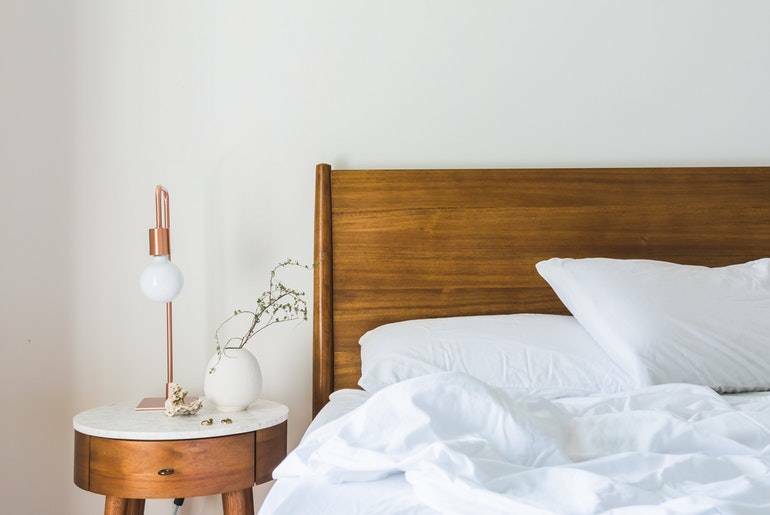 Whether you prefer a solid sleeping surface or a cushiony bottom, liberally invest in getting the finest mattress that suits your individual needs. And whatever type of mattress you choose, ensure it provides proper support for your back, which is vital for your sleep as well as your health. Likewise, get comfortable pillows, blankets, and bed sheets too. Typically, a high-quality mattress should last at least 8-10 years before it needs replacing. When it does become worn out and lumpy, you should certainly get a new one. Temperature plays a remarkable role in deciding how fast you fall asleep as well as your sleep quality. Sleeping in a hot room has been shown to increase wakefulness and decrease deep sleep, according to Dr. Christopher Winter, MD. Essentially, as your body prepares to drift off, it lowers its temperature. So, keeping an external temperature that matches your internal temperature aids your body to cool down and fall asleep. Obviously, everyone has their preferred sleeping temperature. Some like it warm, others like it chilly. But regardless of whether you quarrel with your partner over the control of the thermostat, most experts suggest that the ideal room temperature for a good night’s sleep is between 65 and 72 degrees Fahrenheit. Also, if possible, consider sleeping naked, as it helps your body better control its temperature. Noise at levels as low as 40 decibels can cause trouble sleeping. Ensure you turn off all sound-emitting electronic devices before hitting the sack. But more often than not, the clamorous culprits are beyond your reach or control. For example, you may have noisy neighbors or live in a bustling area with heavy traffic. In such cases, a thick curtain will help muffle the external noise. Additionally, you can use a sound machine that produces a relaxing white noise that aids sleep. You can also play some soothing music if that’s more to your liking, but remember to set a timer so that it turns off once you fall asleep. As a last resort, consider using earplugs. The pineal gland in your brain secretes more melatonin ― the “sleep hormone” ― when it’s dark which makes you sleepy, and less when it’s bright, making you more alert. So, light exposure after sunset tricks your brain into thinking it is still daytime and reduces the secretion of melatonin. In particular, the blue light which is emitted in large amounts by modern electronics such as smartphones, television, and computers, is the worst in this regard. Thus, abstain from using bright electronic devices before bed and try to sleep in a pitch-black room. Use blackout curtains or shades to block external light from windows. If that’s not feasible, try a sleep mask. Also, it’s best to cover up all electronics that emit any light. Doing so will stimulate your body to get ready for its sleep cycle. If you have to wake up in the middle of the night for some reason, use a dim nightlight or a small flashlight and don’t directly look into the light source. This will make it easier for you to fall back to sleep. According to a survey, people that sleep in bedrooms with blue interiors tend to get the best rest compared to any other color. Blue is linked to calm, soothing feelings and is thought to slow the heart rate and even reduce blood pressure. Yellow and Green work well too. On the other hand, Purple should be avoided as it is considered stimulating and spurs creative thoughts. Furthermore, Grey and Brown are regarded as somber colors, and should also be given a miss. Ultimately, whichever color you choose, always opt for paler shades. Don’t take a cluttered room lightly if you wish to sleep well. Being surrounded by unnecessary items and distractions will subconsciously cause anxiety and stress. Your mind just won’t be able to relax properly when your bedroom looks like your workplace. So, shift all items that are irrelevant to sleep such as computer, television, and treadmill to another room. Keep your bedroom exclusive to sleep. This will encourage your brain to deem your bedroom as a place of tranquility and make falling asleep easier. Several studies conclude that aromatherapy ― the usage of plant extracts or essential oils to bolster physical and mental well being ― is very conducive to relaxation and better sleep. Specifically, scents such as lavender, jasmine, and vanilla have been shown to lower heart rate and blood pressure by promoting a sense of serenity. Spraying such fragrances lightly onto the pillow at bedtime can help you sleep like a baby. What’s more, it has even been stated that the scent may sway your dreams, as odor has a strong influence on emotions. A good night’s sleep is undeniably one of the most important determinants of your overall health and prosperity. Fortunately, there’s a lot you can do to get the sleep of your dreams and wake up of fully recharged. Mostafa is a seasoned growth strategist with over nine years of experience in growing SaaS and eCommerce startups. He has worked as a growth team leader at VC-backed startups and consulted with Fortune 500 clients including American Express, P&G, and Ford. Mostafa has also written for Wired and SmartBrief and is a regular tech contributor for the BBC. He currently heads growth at Somn, a sleep community, and eCommerce startup.